Five days have gone past so fast and I am half way through my time at Clevedon. We have had lots more visitors today and the students were only to happy to share their learning with them. Quite a few of the boys are coming everyday with their new 'Ancient Civilisations' minecraft creations. They very proudly showed the visiting teachers some of their ideas. It was lovely to see how interested and excited the other children were as the minecraft students presented via Apple TV. 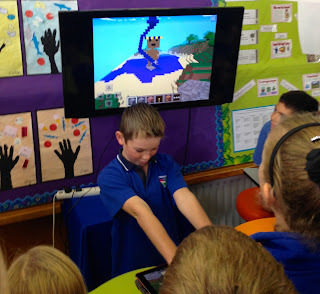 This example is one where the student has made a model of Poseidon in Minecraft. Below, this student is experimenting with temples. I have said to the children that they can take screen captures of their creations and use them as graphics for their publishing and presenting. I now have access to student work through the Google Teacher Dashboard. What I really like about this is being able see all of the students work in one place, what they have updated and when! The students are using the dictionaries within the Kindle app more often now for helping them to find meaning. The Vocab Log is working well, as I am using it as a teaching tool. I put ? next to the words that students have made an incorrect sentence or meaning and we look it up in the 'search' on the Kindle app, look at the word in context and then look at the meaning and decipher what it means in the story. The independent workshops are starting to work better, but I think in future I would not try to use Mathletics, Studyladder and Rainforest Maths for collaborative work. The activities themselves are great and fit right in with our NZ maths but are too hard too navigate to in a group situation. They will have to continue to be used as independent activities with individual sign ins. The students enjoy the workshops and is one of the noisiest parts of the classroom as they all chime in at the same time calling the answers. The best way I have found to use this workshop is to start it off myself, leave them to carry on and go back to set up for the next slide when they are ready. Other workshops I have made for other strands go straight to other websites with no logins or sign ins, so students can work collaboratively through the workshops without a teacher. I talked about Keywords and what they were. I will be using the following slideshow to teach research skills to the students. This blog supports the e-Learning Classroom wiki. It will document how teachers from a variety of schools set up e-Learning classrooms, the successes and the not so successful events. It will record the achievements of the cross collaboration between teachers from different schools in a variety of places in New Zealand. I am a teacher who has taught in many schools in Auckland. For the last few years I have been an e-Learning consultant. I work alongside teachers and students looking for that e-Learning opportunity.